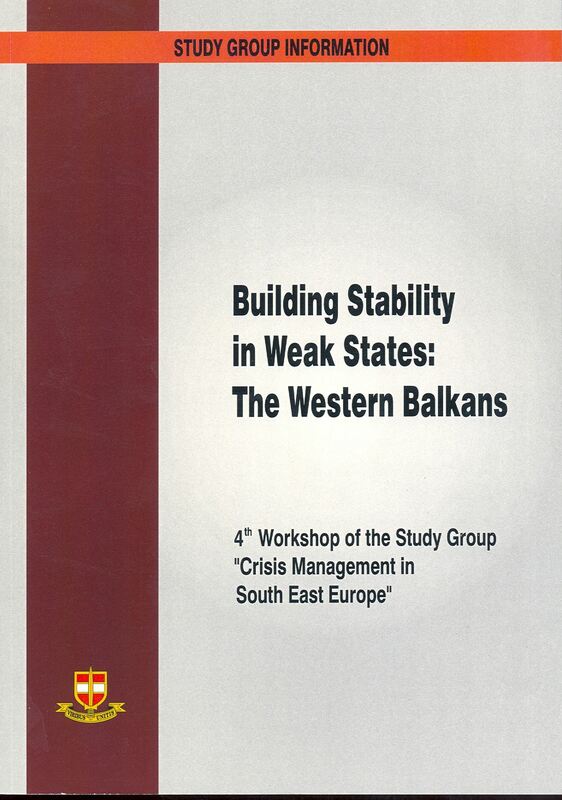 "Building Stability in Weak States" was the topic of a workshop of the Woking Group "Crisis Management in South East Europe" of the PfP Consortium of Defence Academies and Security Studies Institutes which was held from 10-11 November 2001 in Tirana. It is no coincidence, however, that the initiative to develop this important topic for the development of security policy in South East Europe originated at the Albanian Institute for International Studies. Albania is seen as typical "weak State" in South East Europe, even though it has recovered from the quasi-civil war of 1997. This publication has ten articles by conference participants ranging from theoretical discussions to case studies from the region. Most papers talk at length about what are the typical attributes of "weak States". Albert Rakipi (Albanian Institute for International Studies, Tirana/Albania) distinguishes between the terms "weak State" and "weak power". According to Rakipi "weak or strong states" refer to the degree of socio-political cohesion, while "big and small powers" refer to the military and economic power in comparison to other States. Rakipi argues in his study that lack of legitimacy is the primary source of State weakness in a number of South East European States in general and in the Balkans in particular. The Director of the Albanian Institute for International Studies sees a close correlation between the problem of missing political legitimacy and the weak or non-existent statal tradition in most States of the Balkans. Filip Tunjiæ (Centre for Strategic Studies, Ljublijana/Slovenia) thinks that the special geopolitical situation of the western Balkans is the core of their "weakness". This Slovene analyst describes the historical role of South East Europe as border area between different centres of power and between cultural zones. The weakness of small States in the western Balkans (which is caused by strong external influences) shows itself as limited ability to conduct an autonomous foreign policy. In his contribution Spyros Damtsas (Balkan Trust Network, Athens/Greece) presents the thesis that only those States are stable where the population shares a common value system. Such a consensus of the citizens is missing in the crisis areas of South East Europe (e.g. Bosnia and Herzegovina). These States would therefore not constitute a political unity. Enver Hasani’s (Prishtina University, Pristina/Kosovo) contribution is the fourth paper with a theoretical focus. This extensive analysis discusses the preconditions for stability in a system of States and allocates, referring to the stabilisation of South East Europe, a central role in establishing a democratic and peaceful society in crisis areas to the West. The contributions of Janusz Bugajski (Centre for Strategic and International Studies, Washington D.C./USA), Aldo Bumçi (Albanian Institute for International Studies, Tirana/Albania) and Todor Mirkoviæ (Institute for Geopolitical Studies, Belgrade/Serbia and Montenegro) discuss the problems of a few "weak States" in the western Balkans. Bugajski criticises the international community for postponing a decision on the final status of the Kosovo time and again. This would weaken Kosovo, he claims, because it would remain dependent on external powers, even though Serb hegemony has ended. The American scientist advocates a step-by-step reduction of the UN-administration in Kosovo (while retaining the international military presence), because this would halt the process of state creation. Full governmental control should be transferred to the population of Kosovo. The problem of the unclear and temporary status of areas in South East Europe as important factor of regional instability is central to Aldo Bumçi’s contribution. He analyses the security political development in Montenegro. Bumçi sees a connection between the difficulties of the Montenegrin government in their attempts to conduct institutional and economical reform and the unsolved question of the status of Montenegro. The EU-brokered treaty of mid-March (which proposes a loose Serb-Montenegrin union) does not bring clarity to future Serb-Montenegrin relations. This treaty is a temporary measure which would not end the de facto separation. Todor Mirkoviæ analyses the current internal and external problems facing the Serb-Montenegrin State after the end of the Milo¹eviæ era from a wide perspective encompassing the whole Yugoslavia. The basic preconditions for stable development in Serbia and Montenegro are the solution of internal order-political conflict, a good relationship to neighbouring States and the integration in Euro-Atlantic structures. Antonio Leitao (NATO Defence College, Rome/Italy) and Predrag Jurekoviæ (Bureau for Security Policy, Vienna/Austria) analyse in their papers the role of relevant International Organisations in stabilising the western Balkans. While Leitao describes the general possibility that NATO has to act as crisis manager, Jurekoviæ analyses what the EU did with respect to the crisis in Macedonia. A "special case" in this publication is the Romanian contribution of Constantin Hlihor (University of Bucharest, Bucharest/ Romania). Romania is in kind of a "geographical limbo" between the former Eastern Europe and the Balkans. this special position finds its expression in the area of politics as well. On the one hand Romania counts as one of the East European States which are concerned with reforming their structure and are conducting negotiations to join the EU, on the other hand this State is actively engaged in projects of the "Stability Pact for South East Europe". Hlihor’s paper gives us an interesting overview of the activities of Romania in the stabilisation process for South East Europe. It remains to say that I think that this working group is a small, but important contribution science can make to the process of stabilisation in South East Europe. In its unique way it brings together scientists from different areas of studies from South East Europe and, indeed, from the whole PfP area to exchange ideas and to develop new ways of overcoming the problems we are faced with in this dynamic region of Europe. I sincerely hope that we can continue the good work for a long time to come!